The roundshot is a great tool. And its different ! Even I use a Noblex which also follows the rotating lens concept, I need to get used to the Roundshot. No automatic, of course. No viewfinder, only a bracket that helps you to roughly aim or rather estimate where the top and bottom border will be (you need to use a tripod for this feature). Anyway I shot 3 films as starter to learn the way of Roundshots. Most importnat things I learned: At least f-stop 11, you try to expose medium format film with a SLR Nikon lens, there is vignetting at the top and bottom. Expose more degrees than you need, the first and last few millimeters of the exposure are slightly blurred. Go for a dgree value of 180 degree or more, the effect in the picture smaller with smaller values is not as exciting as you get with 180 or 360 degree ! I keep on walking and keep you posted about new and more serious works. I want to use the opportunity and thank Thierry, who helped me to get the Roundshot to Singapore. 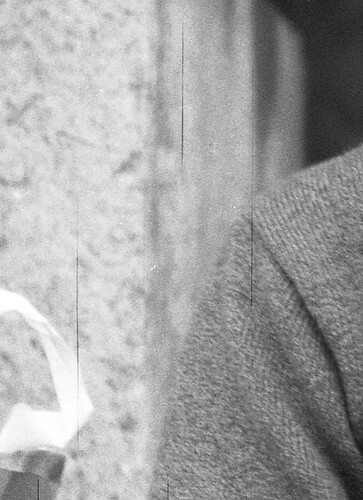 I spare no expense to share my first hand experience with the Lucky black and white film. 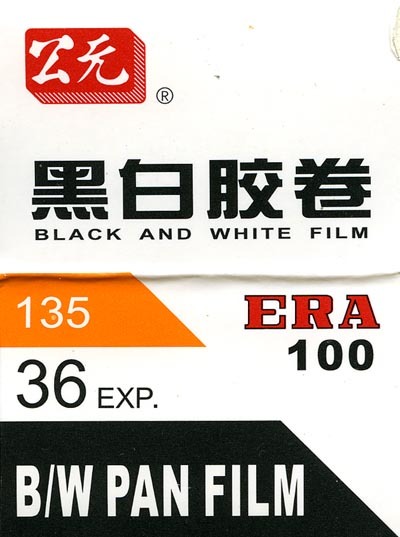 The film gives certain vintage look and easy to handle with exposure. It comes with grain and has for sure its own field of application. I need to highlight the sensibility for scratches, the lab which develop my films never fail so far and I have very good experiences with them, but the Lucky is pretty scratched. I assume its during being wet he get scratched easily. 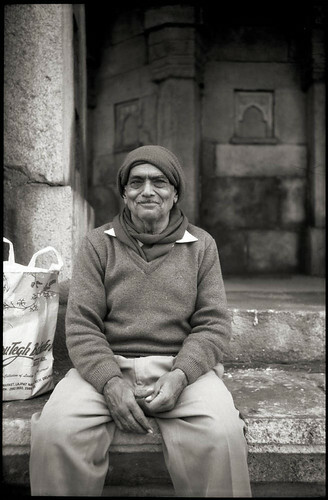 The example image is made with the AGFA Billy Record I from 1953 on a recent trip to Delhi. The second images shows some sample scratches. You were wondering about the panorama in the previous entry? I brought the 1994 NIKON 310 AF Panorama (masking 24x36 frame to 9x36, aspect ratio 1:4 !) with some AGFA Portrait along. Dont expext too much, but it is a REAL panorama, no cropping in PS. And it will not replace my 617 ! But its easy to handle, full auto, no one realize the camera and just take you for a stupid tourist. A short report about my attempt to hunt for the chinese film brand LUCKY whilst staying in Shanghai last weekend. I heard about about a photo shopping center called XING GUANG Photographic Equipment Center in Shanghai (corner Lu Ban Road and Xie Tu Road). You show any cab driver the above signs and he will drop you at the right corner. You cant miss it, its at a big junction with a big city highway above it. A shopping center with 6 floors full of shops where you get anything from the latest digital stuff to old fashion Seagull cameras, tripods and bags in all shapes and sizes and even film. Dont miss the Shen Hao Shop (wonderful wooden large format cameras) and the second hand shops where you get all kind of Leica and Hasselblad equipment at a reasonable price (sorry, I am not expert for these brands, so go there make your own opinion). I also dig out some ERA black and white film. I will update you with the latest results of these films soon. Thanks to Vargas, my Chinese friend to company me there to do the talking, most of the shop owners or staff hardly speak english. This log entry is dedicated to the Noblex 135 panoramas. Always reliable camera, just so sensitive for proper horizon. A short roadtrip from Adelaide (South Australia) to Hawker, Flinders Ranges. I will delight you with a report about this panoramic trip in late January 2007. Australia is famous for its landscapes and its a perfect environment for panorama photography. 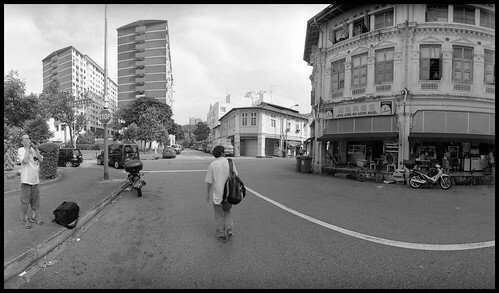 I brought the Fotoman 617, the Xpan, the Noblex and the 1Ds along, quite a lot of equipment in my bagpack ! One the arrival that made us spend some extra time at customs to chat with the officer what all that is for and were we go. One the way back the checkin agent decided to weight my bagpack that goes into the plane with me. A shocking 15kg started a discussion about the maximum weight and number of hand luggage. This is an experience I definitely want to share with you. Anyone who brings along professional equipment easily brings 10 to 20kg to the counter - after checking in tripods and any other non-sensitive equipment. I have really no idea what to do about the weight. Normally in most other countries I travel, they dont bother (yet) to check hand luggage weight (at least big carriers). Conclusion: You cant check it in - its either stolen or broken, you cant bring it on board - only if you travel with your spouse with less hand luggage. I will put my equipment on the scale and will weight each piece and next time - at least for Australia - go on an equipment diet. Putting that aside, Australia is wonderful and the tiny piece of South Australia we explored, gave me 100's of great panorama opportunities in return. During the trip (less than 1 week), covering 1000km, I could make 12 rolls of 617, 3 rolls Xpan and 3 rolls Noblex negatives. I will select some panoramas for you and look forward to get there again. Finally ! The Roundshot 28-220 arrived from Switzerland. 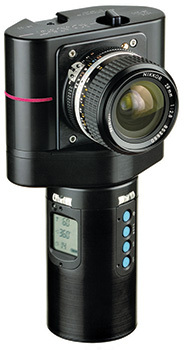 Its not the Seitz 617 digital - who can afford it anyway ? The medium format (120) film based camera is build like a tank and creates panoramas by rotating the whole camera above the grip. Will update you with images soon. More infos about the camera at www.roundshot.ch. Did you realize that you slowly turn blind for your environment after staying for long time at the same place ? I arrived in Singapore 5 years ago and it was full of impressions and photographic scenes seemed to show at every corner. By now I really need to focus on it or, at least walk around with a certain dedication. The interesting part: Being home only few occasions a year I start to discover new (old) things and places at home which I did not notice for years when staying there. Maybe to realize this effect helps to take care of it and opens one"s eyes.